The topic of this month’s take it further challenge is “What do you call yourself? (related to what we do). Artist or Craftsperson? Basically, that’s the old art versus craft debate taken to a personal level. My first thought was “Why, I’m just a dabbler anyway”. But I guess that answer would be the easy way out. I dabble in acrylic paint and watercolour, so I can well call myself an artist. But on the other hand, where is the line between art and craft in paintings? Are paintings in the style of the home decor TV shows art? In fiber, I do a few original things. But I also love doing crafty things like knitting, crochet and mindless embroidery. I think I never really defined myself beyond “dabbler in xyz”, replace xyz with my current subject of study. Maybe it’s high time I think about such things a bit. I don’t really know yet what I’m going to do about that topic, but I think it screams for another sampler, showing the artsy and the crafty sides of me. The colour scheme is another interesting case. The official me hates it but I think my inner child loves it. 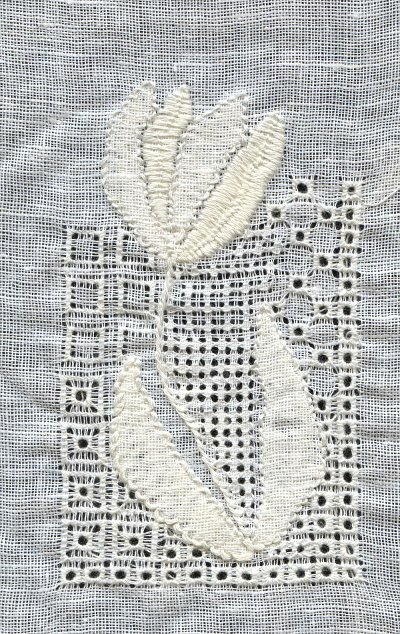 To add a bit of eye candy, here is another progress shot of the pulled thread tulip. If I really do a sampler this will be part of it. Sometimes things just fall into place like this. This ttime, the picture is not clickable, I’ll upload a really big one when it’s finished. This entry was posted on Sunday, May 4th, 2008 at 3:01 pm	and tagged with embroidery, pulled thread embroidery, Take it Further and posted in art in general, embroidery, fiber art in general, Take it Further Challenge. You can follow any responses to this entry through the RSS 2.0 feed. Good to hear I’m not the only one Vero. Thanks! Yep, me too. I don’t consider myself an artist either, rather I noodle about trying out things that take my fancy. I love your pulled thread piece. Just surfed on your site and LOVE the pulled tulip work. Also your take on “artist vs. crafty person” – I have NO art training but am VERY good at several mediums so I call myself an “arty person with no training”!! Also my friends are very complimentary! Hi Christine, I don’t have nay art training either, exept a few evening classes.It matters what you can do, not how you learned it in my book, especially when it comes down to things you do in your free time, for fun.